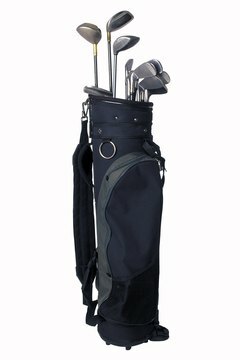 What Golf Clubs Should Be Carried in a Golf Bag? Having the right variety of clubs in your golf bag will give you the tools to hit the correct shots throughout a round. Novice golfers always wonder what clubs they need when starting out in the sport, because there are so many options on the market. It seems that every manufacturer and store sells "complete" sets that have all kinds of different clubs in them, which makes it confusing. On top of that are the rules at various courses that limit the number and kinds of clubs that can be used. So what does a golfer do? Relax, because a lot of times, setting up a golf bag is easier than expected as long as you keep the number of clubs under 14. The driver, which is also called a 1-wood, is key. Some experts say don't bring one if you are not a good golfer, but having that club at your disposal is a must on longer courses. Also, stock a 3-wood, which is easier to control than a 1-wood off the tee, but does not have the same maximum distance. A 5-wood (or any other wood) is very optional. It rarely will be used from a tee, and most golfers do not play courses long enough to warrant it for use on a fairway. Most irons sets start with the 2-iron and go through the 9-iron. Bring all eight of those clubs even though you may not use all of them. They are good to have in case you want to practice with a new club. Bring a putter, a pitching wedge and a sand wedge regardless of your skill level or the course. Some people will bring a lob wedge or a chipper with them and get rid of one of their other irons (such as the 2-iron), and that can be a smart option. A player cannot carry more than 14 clubs on the course. During tournament play, a player must declare what 14 clubs she is using and not deviate from that program or she will face penalty strokes.